With an estimated value of $40 billion to healthcare, robots can analyze data from pre-op medical records to guide a surgeon’s instrument during surgery, which can lead to a 21% reduction in a patient’s hospital stay. Robot-assisted surgery is considered “minimally invasive” so patients won’t need to heal from large incisions. Via artificial intelligence, robots can use data from past operations to inform new surgical techniques. The positive results are indeed promising. One study that involved 379 orthopedic patients found that AI-assisted robotic procedure resulted in five times fewer complications compared to surgeons operating alone. A robot was used on an eye surgery for the first time, and the most advanced surgical robot, the Da Vinci allows doctors to perform complex procedures with greater control than conventional approaches. Heart surgeons are assisted Heartlander, a miniature robot, that enters a small incision on the chest to perform mapping and therapy over the surface of the heart. From interacting with patients to directing patients to the most effective care setting, virtual nursing assistants could save the healthcare industry $20 billion annually. Since virtual nurses are available 24/7, they can answer questions, monitor patients and provide quick answers. Most applications of virtual nursing assistants today allow for more regular communication between patients and care providers between office visits to prevent hospital readmission or unnecessary hospital visits. Care Angel’s virtual nurse assistant can even provide wellness checks through voice and AI. Admittedly, using AI to diagnose patients is undoubtedly in its infancy, but there have been some exciting use cases. A Stanford University study tested an AI algorithm to detect skin cancers against dermatologists, and it performed at the level of the humans. A Danish AI software company tested its deep-learning program by having a computer eavesdrop while human dispatchers took emergency calls. The algorithm analyzed what a person says, the tone of voice and background noise and detected cardiac arrests with a 93% success rate compared to 73% for humans. Baidu Research recently announced that the results of early tests on its deep learning algorithm indicate that it can outperform humans when identifying breast cancer metastasis. 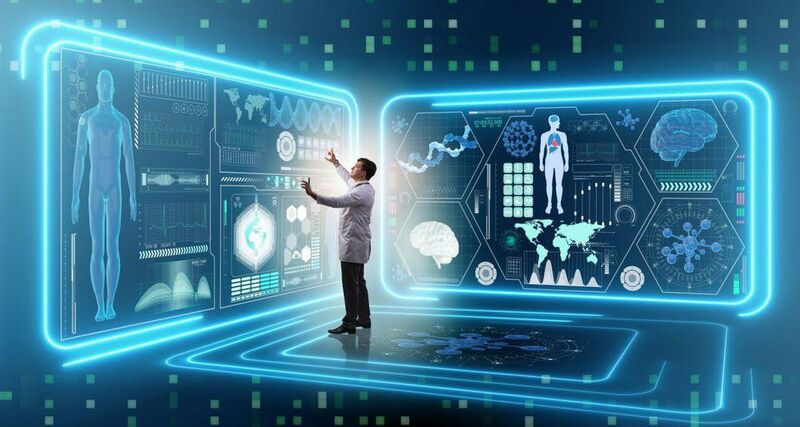 Prime minister Theresa May announced an AI revolution would help the National Health Service (NHS), the UK’s healthcare system, predict those in an early stage of cancer to ultimately prevent thousands of cancer-related deaths by 2033. The algorithms will examine medical records, habits and genetic information pooled from health charities, the NHS and AI. Currently, image analysis is very time consuming for human providers, but an MIT-led research team developed a machine-learning algorithm that can analyze 3D scans up to 1,000 times faster than what is possible today. This near real-time assessment can provide critical input for surgeons who are operating. It is also hoped that AI can help to improve the next generation of radiology tools that don’t rely on tissue samples. Additionally, AI image analysis could support remote areas that don’t have easy access to health care providers and even make telemedicine more effective as patients can use their camera phones to send in pics of rashes, cuts or bruises to determine what care is necessary.